LOS BANOS, Calif. - A sea lion pup is recovering after being found wandering more than 100 miles inland, officials say. 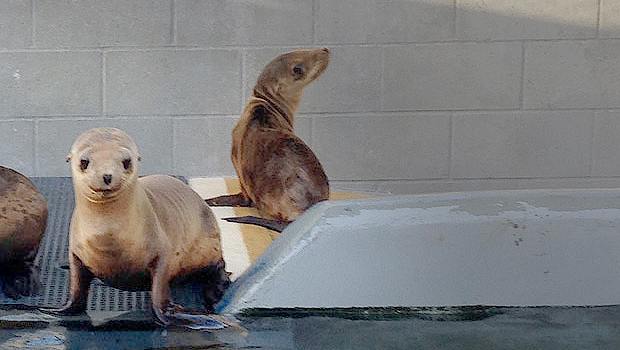 CBS Sacramento reported Wednesday that the Marine Mammal Center in Sausalito has taken in and is rehabilitating the pup - which was given the name "Hoppie" by the person who found him wandering the San Luis National Wildlife Refuge. Officials with the center believe that Hoppie swum up the San Joaquin River, got out of the water and just couldn't find his way back. Hoppie was underweight and malnourished when he was eventually found on March 31. Hoppie is now being brought back to health, with the ultimate goal being getting him back into the wild. "He's feeding well. He hasn't yet gained weight, but that is totally normal and he will continue to gain weight as he continues to get accustomed to his new surroundings," Laura Sherr with the Marine Mammal Center told CBS San Francisco. Hoppie was the second sea lion found wandering the San Luis National Wildlife Refuge. Back in 2004, a 315-pound sea lion dubbed "Chippy" was found. His rescuers found a bullet wound behind Chippy's skull, but the sea lion was eventually nursed back to health and released into the wild near Point Reyes. California Sea Lions range from Vancouver Island all the way to the tip of Baja California, according to the Marine Mammal Center.